Uber customer service could be contacted via http://help.uber.com. Besides that, you can contact Uber via Twitter at https://twitter.com/Uber_Support. If you issue is urgent and has emergency status there is an Uber phone number you can contact The phone number is 800-353-8237 or 800-353-UBER. Please note that Uber specifies this phone as “emergency only”. 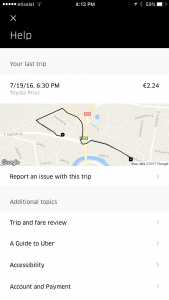 Easiest ways to get to Uber support is from the Uber app. To do this tap on the “Sandwich” icon in the top left corner of the app. 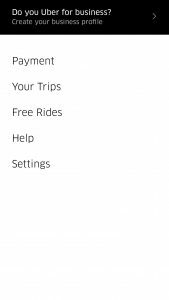 You will see a main Uber app menu as shown below. Tap on “Help” menu item. You will see your most recent trip. If your issue is related to that trip then tap on it and you should see details of the trip on your phone screen. 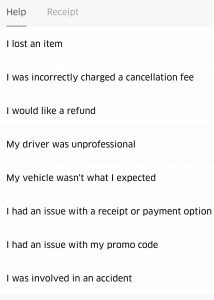 If you selected your last trip you will see a screen like one below. Uber doesn’t have a call center and only emergency phone 800-353-8237 or 800-353-UBER is available. Alternatives way to contact Uner is via twitter https://twitter.com/Uber_Support or from your Uber app (see how to do it above). There is no uber e-mail where you can write to. You either need to contact them regarding your trip from the app or login to Uber website with your details at https://auth.uber.com/login.